Champion Raceway is the new game by International Game Technology. This new game has a marvelous theme. This is because the game takes the players to the race track. Therefore the game is expected to be quite popular as it will attract both, the horse race track goers and the slot lovers. The game has a classic format that has three reels. On the other hand, it has 5 lines, a wild multiplier, a free spins round and a bonus game. This is whenever players decide to give the game a few spins, they will get to enjoy the best of both worlds. Players who want to check out what the game has to offer, they can do that right here for fun. Champion Raceway by IGT is a marvelous game that players will never get enough. 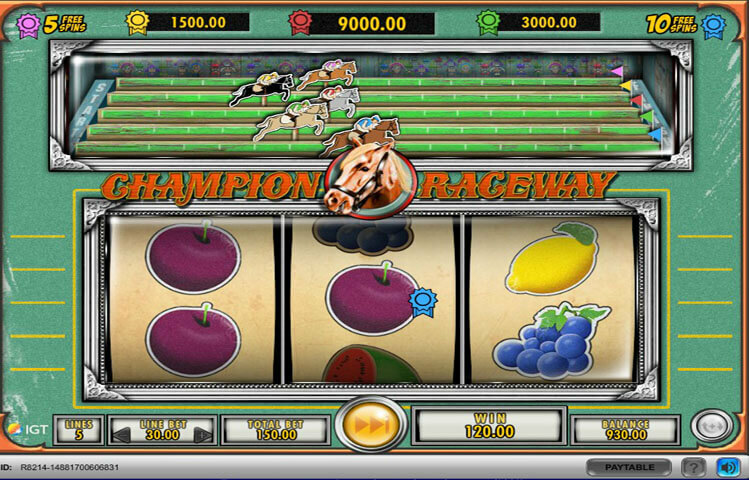 The game has a horse track racing theme that the players will surely enjoy. This is why players will see a race track at the top above the reels. The horses in that racetrack will move and advance during the game play. The game has 3 reels, across which players will find 5 wager lines. Underneath the reels, players will see the control panel of the game. It is where players will be able to place their wanted wagers, spin the reels and control every aspect of the game. The game has amazing visuals and sounds that depict the theme of the game. Since the game is powered by IGT, players can expect a highly rewarding and a well presented experience. This is why players will get immersed into the horse racing theme of the game whenever they decide to give the game a few spins. The players will see horses with derby ribbons at the top, racing in the racetrack. The players will also see green fields with chalk markers surrounding the reels. As for the symbols that are going to be spinning across the game’s reels and lines, they are of a classic nature. These symbols include fruits like watermelons, lemons, oranges, plumbs, and the wild multiplier icon of the game. The game is from the portfolio of IGT, therefore, players can expect plenty of winning chances and special features. The first of these special icons is the wild multiplier. This wild will replace any of the other symbols appearing anywhere across the reels. It will replace the symbol that is going to create the highest payout possible. That is not all, as it will get to multiply the win by x3. The game also has the Derby Raceway feature. This is why there is a horse track at the top. The derby ribbons are sub symbols that can appear with all icons but not the wild multiplier. The horse with the same color of the ribbon will move forward. Horses finishing the race can trigger jackpot coin prizes and free spins.